Sunny Springtime days are just around the corner and there is nothing better to help get you excited than playing with the NEW Simply Spring collection! What sunny day wouldn't be complete without a happy sun looking over everything? I added black pearl stickers to the sun's eyes to make this Odds & Ends die cut dimensional. 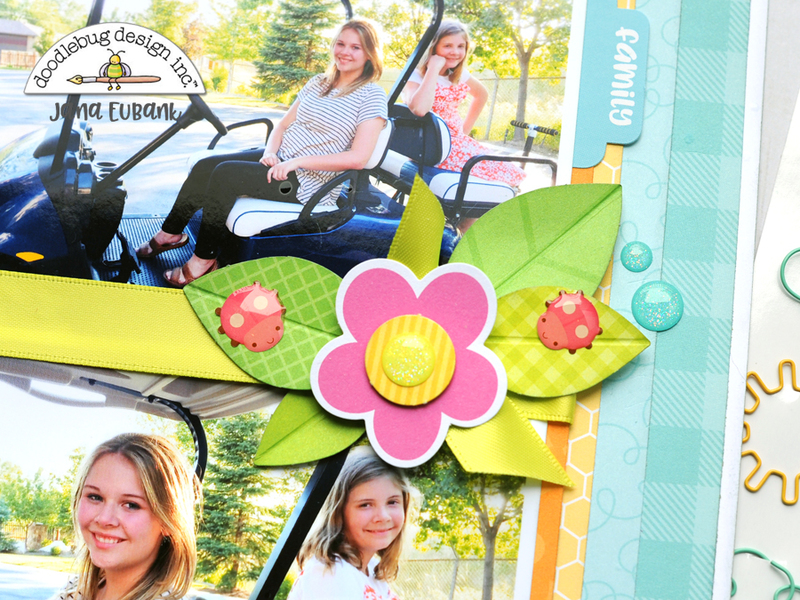 I tied a length of green ribbon around my photos and then decorated the knot with a flower die cut from the Odds & Ends pack. A pair of leisurely ladybug Sprinkles are lounging on the leaves I added from the Garden Flowers pack. I scored the leaves down the center and bent them a bit to bring them to life. At the bottom of the page is a springtime scene of friendly critters having a conversation along the garden fence. Just like the sun above, I have added black pearl stickers to the eyes of the turtle and ladybug. Everyone seems to be so happy the sun is finally out! To frame my design I used the same striped patterned paper (Under My Umbrella Paper) along the top and bottom of the page. I also made sure to include pink and use a scalloped border sticker, as well. Repeating a color or element around your page can make your design more cohesive. Are you ready for Spring? Absolutely beautiful! Love your little embellishment clusters!